Ernie Richardson has long been known as “The King” in curling circles. The king he was and the king he remains, because no other curler has ever skipped a team to four Brier and world titles, a feat Richardson and his team accomplished more than 40 years ago. 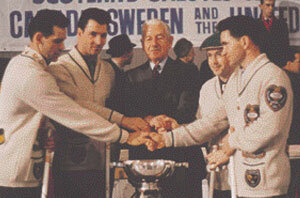 A Scotch Whisky Association representative congratulates the 1962 world champions from Canada, Wes, Ernie, Arnold and Sam Richardson. Canada finished with a perfect 60 record. The Richardsons — Ernie at skip, brother Garnet (Sam) at second, and cousins Arnold and Wes playing third and lead respectively — represented Saskatchewan at the Brier for the first time in 1959. Ernie claims the 1959 Brier in Quebec City was the biggest thrill of all because the team went in as an underdog that had no idea how good the other teams would be. When the round robin ended, the Saskatchewan foursome was tied with Alberta’s Herb Olson at 9-1 and that forced a sudden-death playoff. But the playoff wasn’t much to watch as Richardson posted three in the first end and rolled to a 12-6 victory. Weeks later, the Richardson clan journeyed to Scotland to play in the first-ever world curling challenge between Scotland and Canada. Richardson swept the five-game series against Scotland’s Willie Young to capture the first world men’s title. At the 1960 Brier, played in Fort William, Ontario, the Richardsons finished the round robin with the only 9-1 record on the premises, earning them a second straight Canadian title. That was followed by a trip to Scotland and another five-game sweep — this time at the expense of Scotland’s Hugh Nielson — to claim a second Scotch Cup victory. Ontario, ending the round robin in a three-way tie at 8-2 with Alberta’s Hec Gervais and Manitoba’s Norm Houck. 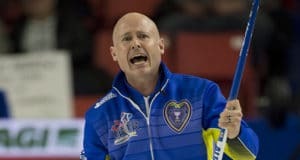 Saskatchewan's Ernie Richardson skipped his team to four Brier and world titles, a feat no other curler has accomplished. 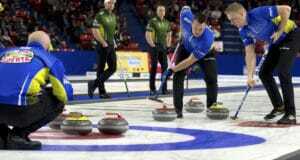 The Richardsons drew a bye in the playoffs and Gervais, the defending Brier champion, sidelined Houck 8-6. But Gervais had nothing left for the final; Richardson opened with three and prevailed 14-7. The Richardsons followed their third Brier victory with a third world title. 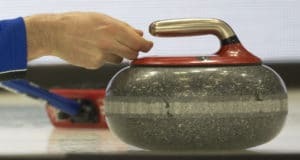 Canada was a perfect 6-0 in the double round-robin competition, which included Scotland’s Willie Young, Sweden’s Rolf Arfwidsson and Fran Kleffman of the United States. The Richardson mystique was in high gear in 1963 as the Saskatchewan team arrived in Brandon, Manitoba, searching for an unprecedented fourth Brier title. The championship was a neck-and-neck race among Saskatchewan, British Columbia’s Glen Harper and Alberta’s Jimmy Shields. 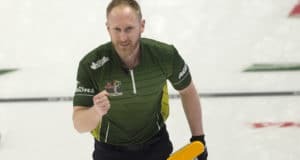 But Richardson — with Mel Perry replacing Wes at lead — picked up his ninth win in 10 games in the final round against Prince Edward Island’s Doug Cameron and, with it, a record-setting fourth title. The second half of the record was completed in Perth, Scotland, where the team successfully defended its world crown. Up against Sweden’s Kurt Jonsson, Mike Slyziuk of the United States and Scotland’s Chuck Hay in a double round robin, the Richardsons suffered their only loss in world play when the U.S. upended them 7-6 in the opening round. Perfect the rest of the way, they finished with a winning 5-1 record.